I HAD never gone up Cape Rachado (or Tanjung Tuan), Port Dickson, to view its famous lighthouse despite having passed by its vicinity every drive down to Melaka using the coastal trunk road. This time, I decided to drop by as it happened to be the site for the annual Raptor Watch that takes place on its grounds. The lighthouse is believed to be the oldest lighthouse in Malaysia, said to be built in 1863 after the original was destroyed in a war between the Portuguese and the Dutch in the 16th century. The structure is made of masonry and whitewashed. The second tower, which houses a Measat radar, is made of concrete and was built in 1990. Parameswara, the founder of Melaka, and its first sultan, is believed to be buried in the area. Visitors are allowed only up to the compound but not into the premises of the lighthouse. The 800m road leading to the lighthouse is well tarred, and flanked on both sides by the original flora of this coastal rainforest. The presence of giant trees like the mata keli (Gynotroches axilliaris), mengkulang (Heritiera simplicifolia), and meranti tembaga (Shorea leprosula) provide a cool respite even on hot afternoons Living under the shade of these trees are a diverse fauna population, including over 50 species of indigenous birds, as well as primates such as macaques and the rarely spotted silver leaf monkey. During Raptor Watch Week, which takes places in mid-March every year, bird lovers and ornithologists zoom into Tanjung Tuan to catch sight of thousands of birds of prey as they ride the thermals to cross the Straits of Malacca from Indonesia on their return migratory leg. When I was there to do a painting of this structure, I met several bird watchers armed with binoculars and long-range cameras. They were perched along the lighthouse's perimeter wall keeping a lookout for the raptors. The previous day, one of them told me over 2,000 raptors had been spotted. As we were talking, another chap alerted us to two Chinese Sparrowhawks which were coming in from the seas. There are several other attractions in area. About 100m from the lighthouse, on the left side of the road, a concrete-stepped trail leads to the beach where an abandoned Dutch well, a piece of rock dubbed the footprint of Hang Tuah, and a Perigi Keramat or "mystical well" are located. Unfortunately, I did not manage to get down to the beach because of a sprained ankle sustained halfway through the trail. There is another jungle trail that leads to a rocky outcrop known as Batu Puteh but this one has been closed due to safety concerns. There is another stepped trail just beside the lighthouse that one can explore. On my way down from the lighthouse, a chance encounter with a park sweeper revealed an interesting side to Tanjung Tuan. According to the man, in the days of old, the jungles surrounding the lighthouse were considered "magical". "When I was young, my parents told me and my siblings that the area is inhabited by invisible beings known as `orang bunian'. These beings rarely disturb humans but sometimes, if they are offended by mischievous visitors, they would make their presence felt. When they cross paths with humans by chance, they would transform into creatures of the jungle to hide their identities. "I also remember tales of a huge white crocodile that inhabit the waters off the coast and which had been spotted sunning on the rocks. That crocodile is believed to be a 'keramat' (a mystical guardian) of the coastline," he said. 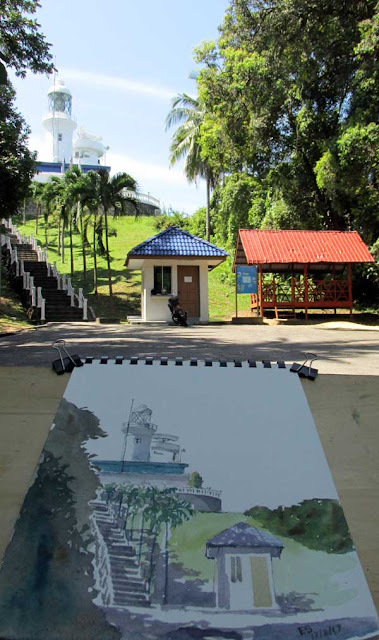 Visitors to the lighthouse are charged RM1 at the foot of the hill. The best times to visit is during weekdays. The road leading to the lighthouse is clean but the incline can be challenging if you are not fit. There are several rest huts for you to catch your breath. RAPTOR Watch began with a group of birdwatchers who were enjoying the sight of raptors making their annual trip across the straits off Tanjung Tuan during their migratory season. 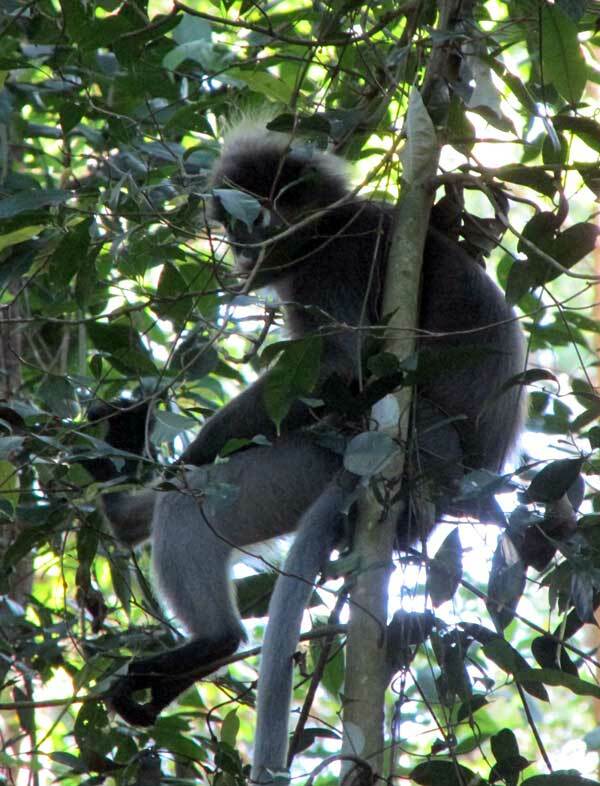 When they heard of plans to develop parts of the Tanjung Tuan Forest Reserve, they realised that the survival of the raptors would be jeopardised as it depends on the preservation of the coastal rainforest. Efforts to raise awareness on Tanjung Tuan as a prominent bird migratory site led to the organisation of the first Raptor Watch in 2000, with two small tents set up by volunteers from the Malaysian Nature Society. 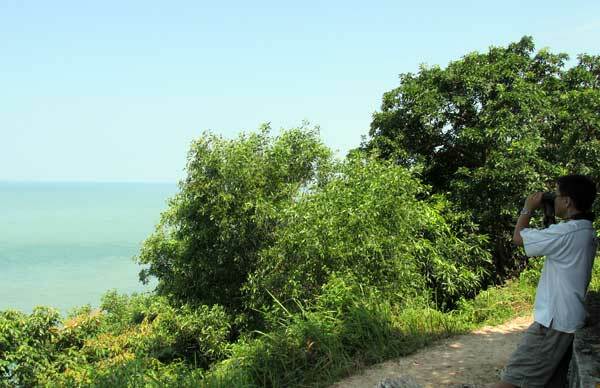 Two nature guides were also roped in on the spur of the moment to take people through the jungle trails to learn more about the flora and fauna of Tanjung Tuan. Raptor Watch has not only brought people, nature and birds together but it had also led to the conservation of Tanjung Tuan's coastal rainforest and turned it into an ecotourism attraction. The annual event has put Tanjung Tuan on the map for birdwatchers and nature lovers around the world, so much so that the cape has now been recognised as an important raptor site by BirdLife International, National Geographic and Hawk Mountain Raptor Sanctuary. TO hikers and climbers who have scaled Gunung Nuang in Hulu Langat, Selangor, this building must have brought back fond memories of their trip. 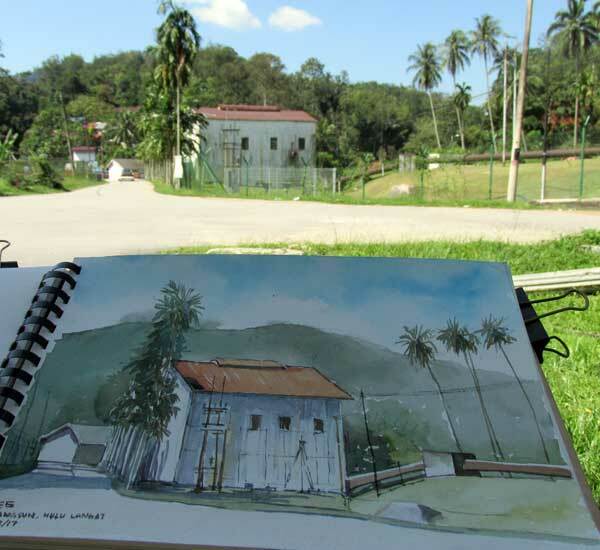 It is the lower station of the Ulu Langat Mini-Hydro Electric Power Plant set up in 1927. Located at Ulu Pangsun, at the foothills of Gunung Nuang, the mini hydro plant is the second oldest in the peninsula and the oldest in Selangor until it ceased operations in 2001. I painted the lower station building from under the shelter of a bus stop, which happened to be the last terminus of the RapidKL, from the city. Ulu Pangsun, located about 38km south of Kuala Lumpur city, is a favourite getaway for city folk as well as those just across the border in Negri Sembilan. Very near to several recreational forests such as the Sungai Gabai, the Sungai Congkak and the Tekala, Ulu Pangsun is accessible by car and RapidKL bus although the road towards the upper reaches are just enough for two vehicles to squeeze through. My attention was drawn to this building because of the contrast of its shape against the verdant hills in the background. There is a row of dilapidated whitewashed buildings believed to be the quarters of the staff of the power plant. Not far from this building is a small tarred road leading up to the base of Gunung Nuang and the Sungai Langat dam. According to a teenager who was waiting for a bus to go to school in town, the place is usually crowded during weekends and public holidays. It is from this point that hikers could mount their assault on the 1,439-metre high Gunung Nuang. For the less adventurous weekenders, however, they can find plenty of picnic spots just beside the main road into Ulu Pangsun. The meandering Sungai Pangsun provides many shady spots for a picnic or a quick dip in the crystal clear waters. Some of these had been developed by the more enterprising land owners by providing sheltered huts that can be rented from as low as RM10 for a day. There is also no shortage of resorts for those who want to enjoy the quiet of nature or do some jungle-trekking activities. Many of these, including Kem Lubok Manggis, Impian Rimba Resort and Nur Lembah Eco Resort, are well known venues for corporate team-building events because of the proximity of their location to the city. There are several other places worth checking out if you are visiting Ulu Pangsun. Among them are the Sungai Chongkak Recreational Forest, the Lubok Manggis picnic grounds, the waterfalls of Perdik and Sungai Lepok, as well as the Tekala and Gabai recreational forests some distance away. There is also an Orang Asli village in Ulu Pangsun. As I was driving out of Ulu Pangsun, I stopped by a patch of sweet potato plants by the main road. An Orang Asli chap was plucking them. When I asked if he planted them, he laughed and said that the plants grew wild. “Anyone who wanted to eat them are welcomed to pluck some,” he said with a grin. I refrained from asking him how much these would have cost, stir-fried, in a restaurant in the city. If you have daylight on your hands when visiting Ulu Pangsun, take a drive along Jalan Sungai Lui towards Semenyih. The journey of over 10km will take you along the perimeter of the beautiful Semenyih Dam and enjoy the sights of its verdant hills. Ulu Langat mini hydroelectric plant is believed to have come about in the early 1920s when the tin mines sprouted up in Kuala Lumpur. According to early records, the beginnings of the Ulu Langat plant could be traced back to Cornishman George Simms, a prospector who ran the Sungei Besi Mines Ltd. Simms was said to have scoured the hills of Ulu Langat on horseback to look for streams to power a hydroelectric station after hearing about the successes of other mines using hydroelectric power. After overcoming strict government regulations, the Sungai Besi Mines was granted a 42-year licence to operate the power plant, with the condition that the government had the first option to purchase the excess electricity. Upon the plant’s completion, electricity was supplied through 29km of transmission lines running through the jungles. In 1933, the government bought over the plant for 200,000 pounds (RM1.1 million). When the Japanese Army invaded Malaya in 1941, all power stations were ordered to be destroyed under the retreating British Army’s “scorched earth” policy. 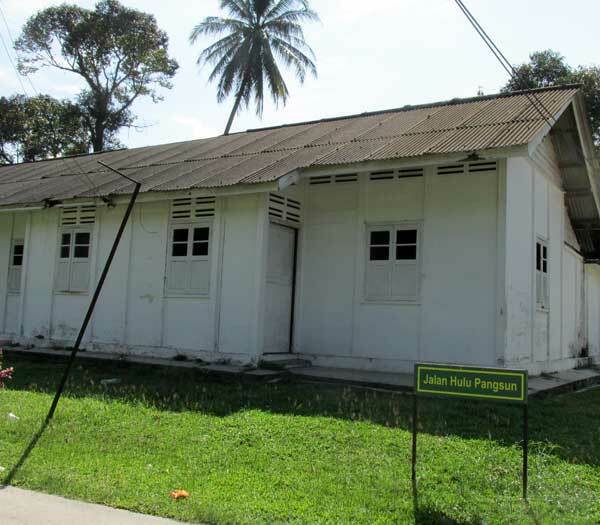 The Ulu Langat stations were also incapacitated during the war, only to be rehabilitated when the British returned.